Hispanic youths are increasingly acquiring marketable skills, and a primary avenue is through increased school enrollment (Figure 5). 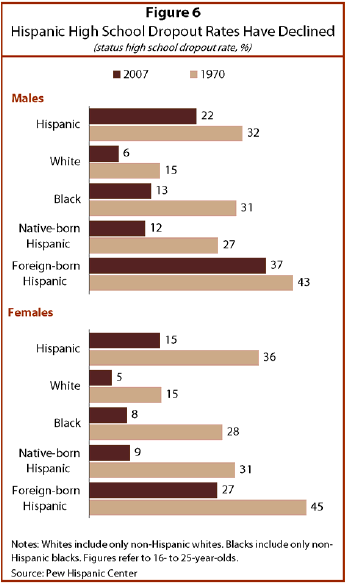 Similar to white and black youths, many more Hispanic youths are enrolled in school or college in 2007 than in 1970. Among Hispanic youths, increased school enrollment has been concentrated among Hispanic females. In 1970, one-third of Hispanic females were in school or college; in 2007, nearly half were pursuing an education. Among young women in general there has been a very large rise in school enrollment rates (Card and Lemieux, 2000), and young Hispanic women are increasingly attending school as well. Young Hispanic men overall have not increased their school enrollment since 1970, but that partly is due to changes in composition by nativity. As Figure 5 shows, young Hispanic males born in the United States have an increased school enrollment rate, though the increase lags behind that of other groups. Hispanic school enrollment rates have risen in part because young Hispanics are increasingly staying in school and trying to finish their high school education (National Center for Education Statistics, 2008). In 1970, about one-third of young Hispanics were high school dropouts. In 2007, one-fifth of young Hispanics were high school dropouts. High school dropout rates have declined for young Hispanic males as well as Hispanic females and have particularly plunged for Hispanics born in the United States (Figure 6). For example, in 1970 nearly one-third of young female Latinos who were born in the U.S. were high school dropouts. By 2007, less than one-in-ten U.S.-born female Latinos were high school dropouts. 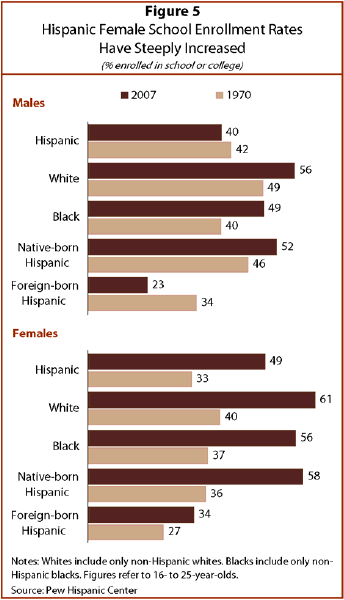 Though Hispanic youths have made tremendous progress staying in school, white and black youths have as well. Thus, it remains the case that Hispanic youths are much more likely than white youths to drop out of school. For example, in 1970 native-born Hispanics, educated in U.S. schools, were about twice as likely (29%) to drop out of high school as white youths (15%). In 2007, U.S.-born Hispanic youths were still about twice as likely to drop out as white youths (10% vs. 5%). In spite of progress, Hispanic youths have not reached parity with white youths in completing high school. Social scientists have noted the gender revolution that has taken place on the nation’s college campuses. Since 1947, college enrollment has grown increasingly female (Goldin, Katz, and Kuziemko, 2006). Young Latino women have fully participated in this higher education revolution. In 1970, only 19% of female Hispanic high school completers were enrolled in college (Figure 7). By 2007, 44% of young female Hispanics with a high school education were enrolled in college. 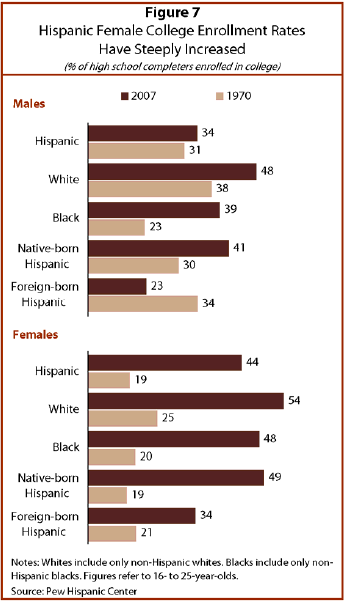 Among native-born female Latinos who have finished high school, almost half (49%) were enrolled in college in 2007. The college enrollment rates of young Hispanic men have increased (from 31% of high school completers in 1970 to 34% of in 2007), but the gains have not been on the order of magnitude achieved by Hispanic females. Although Hispanic youths have markedly increased their college enrollment rates since 1970, white and black youths (particularly white and black young women) are also attending college at much higher rates. As a result, gaps in college participation have not declined much. The white college enrollment rate (calculated among youths who have finished high school) increased from 31% in 1970 to 51% in 2007. Among native-born Hispanic youths, the comparable college enrollment rate increased from 24% in 1970 to 45% in 2007. The gap between white and native-born Hispanic youths in college enrollment has not narrowed much since 1970. Hispanic youths continue to trail white youths in building skills via college. Why are so many more young Hispanic females enrolled in school now than in earlier decades? There are likely many factors involved, but clearly associated with their increased school enrollment rate is a decline in motherhood. Motherhood is an impediment to schooling. Young women who are mothers are much less likely to be enrolled in school or college than young women who don’t have that responsibility (Figure 8). For example, among young Hispanic females who were not mothers, almost 60% were in enrolled in school or college in 2007. Among their counterparts who were mothers, only 15% were enrolled in school. 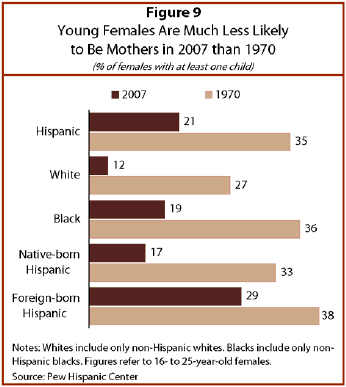 Similar to other young women, Hispanic females in 2007 are much less likely to be a parent than in 1970. In 1970, more than a third of young Hispanic women had at least one child of her own in her household. 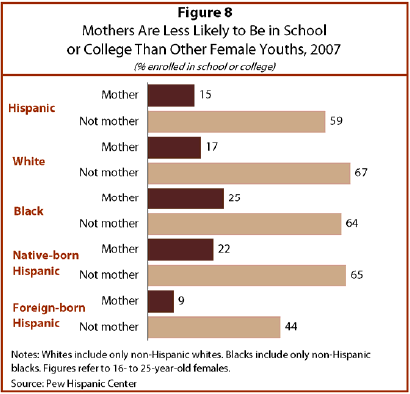 By 2007, the rate of motherhood was only one-in-five among young female Latinos (Figure 9).8 The very significant decline in parenting responsibilities would be expected to strongly discourage school leaving and increase college-going (Ahituv and Tienda, 2004).